“Further Proof that GS is Overrated” or “The Most Fun I’ve Had In a 5-Man Recently” | Are We New At This? Regardless of my other activities in WoW, I manage to run at least one random dungeon a day for those precious, precious Frost Badges. Except for the last week-and-a-half. The last 10 days or so I have been running Ahune because he takes all of two minutes and gives me the same two badges with much less work. Prior to the Midsummer Fire Festival, the Gods of Random Chance dealt me my cards, and I was teleported to the Halls of Stone with the group pictured on the right. 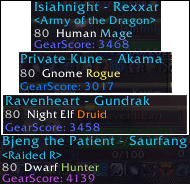 The average GS was 3521 (rounded up and not counting my personal PvE GS of about 5,200). That is fairly low, especially for an event like the Tribunal of Ancients. Even the tank was a complete greenhorn, admitting early on that he had the fundamentals of tanking down, but this was one of his first instances as a druid tank. Most would cringe by this point. Surely a group so under-geared with an arguably novice tank is destined for wipes and all manner of lolfails. What followed instead, was one of the most challenging and fun instance runs I have had in a long time. It took us a good hour and a half to clear the place out, and at no point did feel that I could have done something better with my time. There was an unsaid level of camaraderie and teamwork that worked to our advantage, and instead of being disheartened at the abysmally under-geared group, we took the challenge head-on and went about cleaning house. In addition, everyone was lighthearted, didn’t take the whole thing too seriously, and there was playful banter that kept things alive. By the time we ended, we had had zero wipes, two deaths in all, and one of the most enjoyable Wrath 5-mans I had ever had the pleasure of running. And we did it all with a GS-deficient group that only had good players, teamwork and positive spirit going for it. So if you are a GS-aficionado, the next time you decide to announce a 5.6GS requirement for a “lightening quick” 5-man, I hope you are reminded of this post and you die a little inside. You jackass. I just got back from the game and I have to agree that the GS requirement is getting out of hand. When I left there was no such thing as GS! I guess it is a good detterent and gear check but some people go way overboard. The hunter kept quiet, but I got the impression that he/she was also new/inexperienced. But the camaraderie and the spirit of working together made the run totally smooth, and the occasional “is it ok if I need this? my (insert gear slot here) is 187” made for one of my most enjoyable dungeon experiences ever. By the end, the DK was doing 2200 DPS, the rogue wasn’t far behind, we had no deaths, and the dungeon didn’t take all that long. The GS thing is getting SUPER old. And from a tank’s perspective, it is sometimes easier to tank those types of runs than the “5 guys in H ICC gear” ones, where people are AoE-ing the crap out of everything and drawing massive threat. THAT’s one of the things that makes LFD so soulless. The type of run you describe, however, is where you can really find some fun and sense of accomplishment. Ok so I’m finally catchin up on your blog after having only read the first maybe 5 posts. This one is great! I love when stuff like this happens. agreed that GS is horrible.